Junie's getting to be a professional lunch lady. That means she gets to hang out with Mrs. Gutzman in the cafeteria, standing behind the counter, and even wearing an actual hair net. This paperback edition includes a Junie B. standee. Illustrations. Consumable. 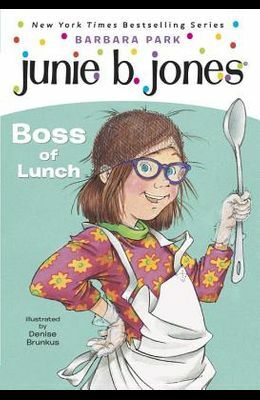 From the front Cover A Junie B. Jones Book, #19 Something very wonderful is happening to Junie B. Jones. And it's called--hurray, hurray!--she's getting to be a professional lunch lady! And that means hanging out with Mrs. Gutzman in the cafeteria. And standing behind the counter. And even wearing a real actual hair net! Who knows? Pretty soon she could be the boss of the whole entire lunch operation!